"Ringling publicity photo. Chuck was a good friend of Bobby Kay and a nice guy; he finished his career at Ringling as Men's Wardrobe assistant. Billy Ward became a clown after appearing with the Ward-Bell fliers trapeeze act...His wardrobe and make up were given to him by his uncle, the noted clown Earl Shipley; his comic approach was all his own, however." A clown is a person who performs in unusual ways to make people laugh. 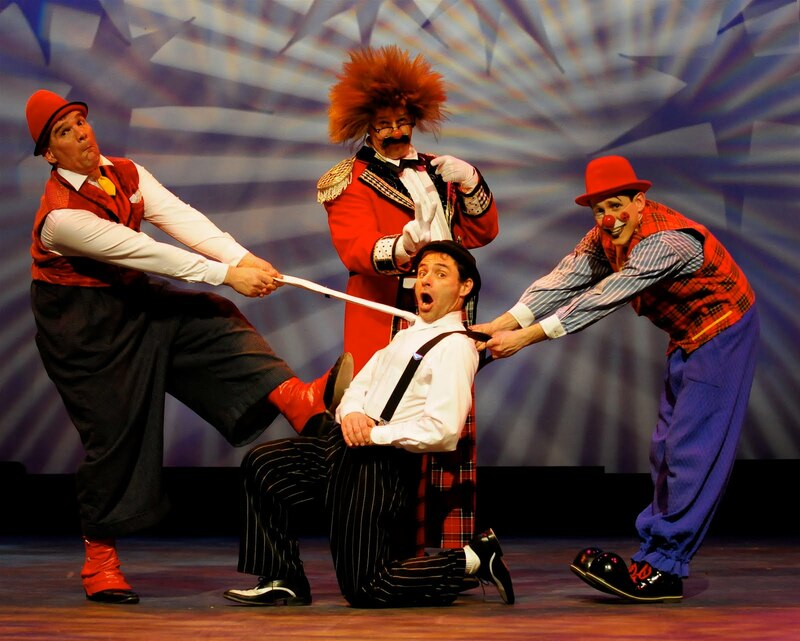 People often think of a baggy-pants circus performer doing pratfalls but clowning ranges from broad physicality to subtle wordplay, and includes comedians of stage, television and movies. “Clown” also refers to symbols that shape how people understand this comic performer. The history of these symbols— kids’ friend, crude buffoon, free spirit, sad figure hiding tears, truth-telling trickster — inevitably weaves through the history of clowns. Since the first caveman bumped into a mastodon and got a laugh, comic figures have been integral parts of human society. Their status has varied from culture to culture and individual to individual. Most remained random figures, as funny as that guy back in high school but now known only to his tribe and time. Others developed into cultural icons, like the nineteenth-century German clown Pickelherring or the clown-spirit figures of Native American tribes, like the “contraries” and the koshare. Sometimes the clown role became more formalized, especially in the stage clown. Theater clowns have an ancient lineage. Comedies in ancient Greece featured bawdy comic figures. Ancient Rome applauded its “mimes,” rowdy physical performers in farces, with little connection to the current sense of mime. Other comic figures pop up over the next fifteen centuries and into the Middle Ages, in local festivals and holidays. 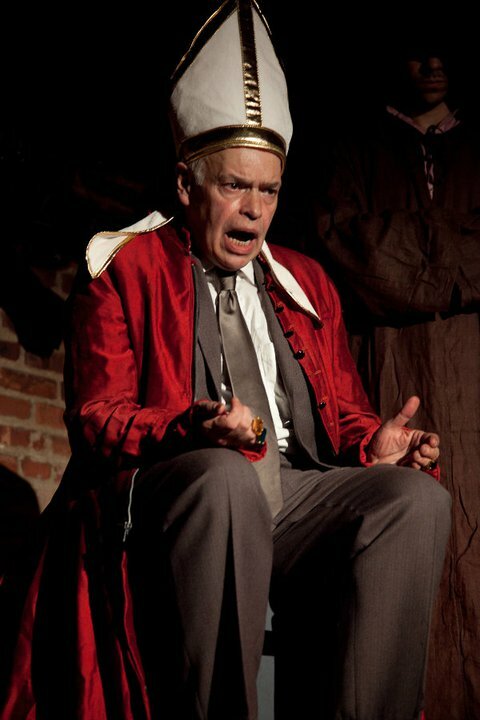 Medieval religious plays sometimes had a comic figure beating the devil offstage. A few performance-like events included a “Lord of Misrule,” upending traditional rituals in the “Feast of Fools,” a new-year festival possibly derived from early Roman rites. Court jesters pop up in histories, not necessarily because there were so many of them but because much has been written about kings and their courts. Some jesters were like royal mascots, their silliness helping pass the time. Others were physically or mentally disabled people kept at court to be mocked themselves. The court jester has been celebrated as a daring political figure, speaking truth to power. But actual instances of comic subversion are rare. Ancient tyrants were no more likely than modern ones to tolerate defiance. The fantasy remains a fond favorite of fiction however. Shakespeare crafted the perfect literary example in the Fool in King Lear, who said to Lear what no one else would. Historically however, court jesters got laughs the way comedians traditionally do, by making jokes the audience approved. Around 1600 Shakespeare placed the jester and rube side by side in As You Like It. Touchstone is identified as a court fool and listed as “Clowne,” while he greets a rustic shepherd by calling him “clown.” Shakespeare’s clown-actors, William Kemp and Robert Armin, neatly symbolize the physical/verbal range of clowning, with Kemp more physical and buffoonish, like Dogberry in Much Ado About Nothing, and Armin more verbal, like Touchstone. A century earlier saw another development that would influence clowning, when commedia dell’arte developed in Italy. “Dell’arte” meant “of the profession,” referring to the craft of professionals improvising, in contrast to commedia erudita. Commedia dell’arte used rough outlines for their vulgar improvisations on makeshift stages, often outdoors, sprinkled with “lazzi” or comics bits, while commedia erudita’s educated amateurs used written scripts and saw themselves as refined. Influence on clowning can be particularly seen in commedia dell’arte’s spontaneity and in its servant characters, called “zanni.” Arlecchino, originally a minor character with patched clothes like a tramp clown’s, became more prominent as his costume settled into the bright diamond-shaped pattern associated with the Harlequin’s costume; that elegant look would resemble some twentieth-century whiteface circus clowns. Arlecchino also had a prop with its own influence on comedy: This character carried a “slapstick,” a narrow board with a hinged piece that both made a loud noise and softened the blow when used to strike someone. Other character were what later would be called “second bananas,” like Brighella, Scaramuccia (or Scaramouche), and Scapino, variously cynical, witty or braggarts. Meanwhile the best-known clown in these early years never appeared in a circus. Joseph Grimaldi, who embarked on his career around the same time circus began, only appeared on stage. Unlike earlier stage clowns, he did not take a comic role in a play, but starred in a performance of knockabout comedy. He and his competitors used a whiteface makeup and fancy costume that strongly influenced the makeup, costume, and knockabout style of circus clowns. Grimaldi’s fame generated two popular bits of lore. The first says that clowns are called “Joeys” in his honor. However, it is not clear when that nickname first appeared, or if it was a nickname was used within the profession or was simply an affectation by writers. A second tale, told over the years about many famous clowns, may have started with Grimaldi: A sick man visits a doctor, who says he’ll feel better if he goes to watch a famous clown in town, at which point the man says, “Alas, doctor” — the tale frequently includes “alas” — “I am that clown.” Though these tales may not reflect historical fact, they testify to the early emergence of romantic notions about clowns. As circus began to dominate American amusements, clowns and riders dominated American circus. In the 1830s most circuses had two kinds of clowns, whiteface and blackface. The whiteface focused on knockabout comedy; the blackface clown combined physical and verbal comedy, in an awkward but immensely popular exploitation of stereotypes about black people. The whiteface-blackface combination began to fade when minstrelsy spun off from circus, after a quartet of blackface circus clowns formed the Virginia Minstrels in 1843. Though circus, like other kinds of amusements, would continue to employ blackface comedy, the craze for minstrelsy would continue into the next century. A 1923 book, How to Put On An Amateur Circus, included tips on blackface, and blacked-up comics survived into the 1940s, including Marx Brothers movies and Bing Crosby in blackface in the movie Holiday Inn. The talking clown emerged in the 1840s, perhaps because of the loss of the verbal comedy of the blackface clown. 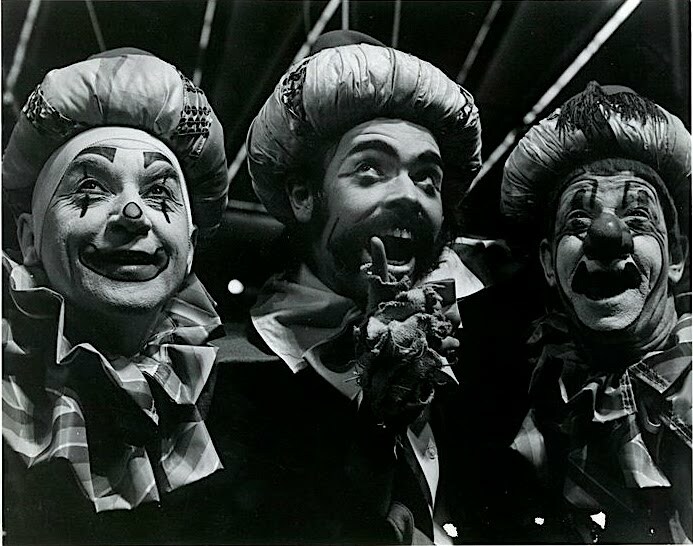 The talking clown included two sub-specialties, the singing clown and the Shakespearean clown. The talking (and singing and “Shaksperian”) clown Dan Rice became the best clown of the century, the best-known circus performer of the century, and by 1860 one of the best-known people in any field in America. (The lingering blackface influence helps explain why Dan Rice is still confused with an earlier blackface stage comedian, T.D. “Jump Jim Crow” Rice.) 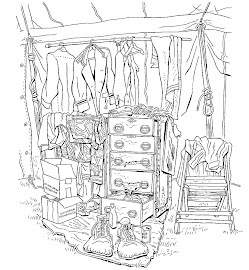 He started in whiteface and occasional blackface, including a stint with Dan Emmett, author of “Dixie.” As his fame grew, he traveled all over the United States in his own tents every summer and performed in major city theaters over the winter. Dan Rice was almost certainly seen by more people than any other American of his age, as he drew large audiences with his quick wit and “hits on the times.” As he expanded his commentary into politics and presented himself as “The Great American Humorist,” he performed without makeup, as a well-dressed middle-class gentleman in tie and tails. Rice further expanded his commentary to run for political office from the circus ring. Though later accounts would dismiss his campaigns as jokes, he ran legitimately for the Pennsylvania legislature, Congress, and president. Dan Rice’s pre-eminence attracted many fictions, which continue to be mistakenly repeated as fact. He did not campaign for Zachary Taylor in 1848, nor did that imaginary campaign create the phrase “on the bandwagon,” which only became political slang in the 1880s, with no connection to Rice. He also was not friends with Abraham Lincoln. A fierce political foe of Lincoln, Rice was a Copperhead during the Civil War, a Peace Democrat who argued in the ring against Republicans and Lincoln. However the two men may have known each other, and were paired in the public mind as two uncouth jokesters. Another popular tale, that Uncle Sam was modeled on Dan Rice, comes closer to truth. First, it must be emphasized that Rice was not a direct model for the Uncle Sam icon. For all his boasts, Rice never made this claim for himself, and anyway the Uncle Sam icon had been developing for decades. Further, the symbol we know today was drawn in 1869 by the cartoonist Thomas Nast, a fierce Republican, who would not have consciously used a famous Democrat like Rice as a model. However Rice was one of the few popular figures among all strata of American society and in all regions, and the Uncle Sam figure combines elements of the look he was nationally known for: The stars, stripes and top hat of his traditional clown costume blended with his tailcoat as “The Great American Humorist,” all punctuated by his even more famous goatee. So though he cannot be definitively identified as its model, if America had any original for Uncle Sam, it was Dan Rice. Circus grew in the late nineteenth century. Though earlier circuses presented in tents seating thousands, experimented putting shows on trains, and presented winter seasons in major city theaters, after the Civil War it enlarged more. The biggest circuses multiplied to three-rings and hired hundreds, with many shows taking to the rails. These expanded outfits needed more clowns to fill the bigger space. Solo talking clowns gave way to clusters of knockabout clowns in masses of sight gags. The usual interpretation says that talking clowns disappeared because they couldn’t be heard in the larger tents, though ringmasters continued to speak. Another reason for the decline of talking clowns was the change in culture. Audiences increasingly liked their amusements to be more polite than rowdy, especially as circus became redefined as “family entertainment.” In any case, Rice’s brand of political commentary would be forgotten, and over the next hundred years people would expect, as circus ballyhoo put it, a “clattering cacophony of clowns. As circuses increasingly touted their large groups of clowns, it became difficult for individuals to stand out. Still, some did. In the early 1900s, Slivers Oakley was probably the best of his era. Later famous names include Otto Griebling, who many circus people consider the best twentieth-century clown; Emmett Kelly, easily the most famous, thanks to his movies and TV appearances; Felix Adler, known for appearing with a trained pig; Paul Jung (pronounced “jung” rather than the German “yung”), a renowned producing clown, or creator of gags; and Lou Jacobs, identifiable by his famous face on many Ringling posters over the years, with a giant nose, big scoop of makeup on his mouth, and a tiny hat on a high domed head. These new large groups of clowns led to use of the phrase “Clown Alley.” That refers both to the clowns’ dressing area and to the group of clowns together. It’s unclear how or when the twinned labels emerged. The likeliest origin was the dressing area these masses of clowns required, an alley-like space off the performers’ main route into the big top. (The early twentieth-century emergence of “alley” as a collective noun, such as “Tin Pan Alley” for songwriters and “Gasoline Alley” for gas stations, suggest “Clown Alley” may have started about the same time.) By the kind of extension common in slang, the label “Clown Alley” would then be applied to the clowns themselves. 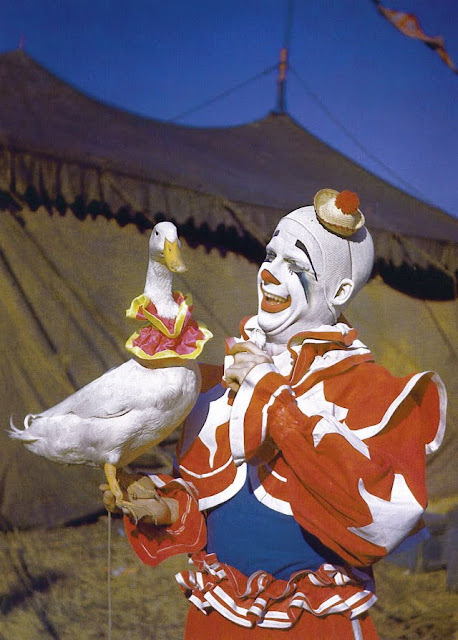 A more romantic origin story looks to the French language, saying clowns were summoned to “allez” or go into the tent, though American circus didn’t have much of a French connection. The twentieth century also generated circus-like clowns in other venues. 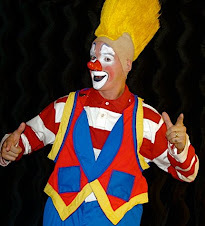 The rodeo clown, a 20th-century creation in makeup and patched clothes, can be considered the performing kin of the hick clown, an older circus type. However rodeo clowns focus on one primary and dangerous task, distracting wild bulls from fallen riders. That leaves little time for full comedy routines, and some now call themselves “bullfighters” instead. Then there is the baseball clown, which usually refers to Max Patkin, who made a half-century career out of clowning at baseball games. The clown had originally been symbolized as a boost to rowdy good spirits for adults. In 1835 Herman Melville wrote “The Fiddler,” a story about a world-weary man given a new perspective on life by the example of a world-renowned genius who gets pleasure from a clown. Written long before clown symbolism exploded, this story unsurprisingly includes no children. Similarly, Charles Dickens made the circus a symbolic contrast to the rigidities of industrialism in Hard Times, also 1853, but included no clowns. But that adult focus faded in the late 1800s, as symbolism grew with the growing numbers of clowns. Most of the popular and literary images of clowns emerged then, as the clichés began to overwhelm the work itself, what a clown actually said or did in the ring. Clowns particularly got the sentimental treatment, recast as the special friend of children, themselves becoming sentimentalized. Another newly popular tale told of the clown sad at his lost or unrequited love for an equestrienne or female acrobat; the tears of a clown, hiding his pain behind the mask. Though there is nothing inherently sad about this kind of worker, the dramatic contrast of laughter and sadness has been irresistible to countless writers. The friend-of-children and sad clown notions overlapped, with the lost-love often replaced by a child dramatically sick or dying. As for the old tale, told about Grimaldi, of the sick clown consulting a doctor who prescribed a visit to the clown, that became especially applied to clowns who died in poverty. An eventual addition to the constellation of symbols would be the angry clown, bitter at the world and only able to connect to people through his comedy. Then there is the allegedly subversive clown, a late 20th-century notion (discussed below). These symbols might be dismissed as mere stories except that they shaped — and shape — how people understand clowns. One of the first tropes, of the clown-&-innocent-child, and still among the most quoted, comes in the circus depicted in 1884 in Huckleberry Finn. Mark Twain had enjoyed the rowdy circus before the Civil War, including Rice’s sharp quips. (Twain expressed interest in being a clown himself, while Rice joked late in life that Twain had stolen his material.) But even as the author wrote accurately elsewhere in his book about that earlier era, he altered the circus in chapter 22 to give the Gilded Age what it wanted, an innocent child in awe of a clown. While Twain’s clown wouldn’t be the first considered “quick as a wink with the funniest things a body ever said,” it was one of the first that included a spellbound child. Another powerfully symbolic image appeared a decade later. In 1892 the opera Pagliacci gave the world a durable symbol of the sad clown, hiding his tears behind the mask. (Of course in these sad-clown stories, these supposedly hidden tears are seen by everyone.) From then on, the clown-as-children’s-friend and the sad clown became standard in newspaper stories and books, then movies, television, and advertisements. These clichés did not appear only in popular sources; high culture indulged. The clown was a natural for painting. The clown makeup highlights the human face in recognizable yet intriguing ways, and the costume and setting offer color and an exotic background. Writers have relished the clown, with the exotic context of circus, and dramatic contrast of clown laughter to darker themes. In 1948 Henry Miller wrote a slim volume, The Smile at the Foot of the Ladder, a romantic tale about a clown. The Nobel-Prize winner Heinrich Boll wrote The Clown in 1963, an exploration of German guilt following World War II through the highly symbolic figure of its title character. The 1960s brought a significant change to clowning. It became participatory; it seemed as if anyone could do it. Previously clowns had been the ultimate cultural outsiders, unconnected to normal life. That was a key part of the fascination with circus, its status as a separate world. It was also part of the allure for those who “joined on”: Circus accepted those who didn’t fit normal life. As one of the most well-known phrases about the business put it, you had to “run away and join the circus.” Not surprisingly, many clowns were old circus hands who stayed “with it and for it” even after quitting their original specialty. Otto Griebling rode horses, Swede Johnson was a lion trainer, and Lou Jacobs began as a contortionist and acrobat. 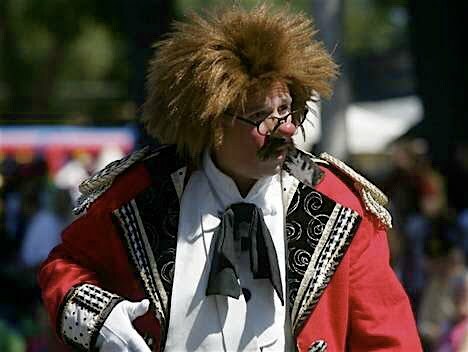 (Though Jacobs was German, European clowns tend to be better known for playing instruments, as musical clowns.) Meanwhile the training had been a craft apprenticeship, with mentors and lessons learned through the mistakes of experience. Now anyone could make a costume, throw on makeup, and go in public as a clown. An announcement was sufficient. The “Clown College” of Ringling Brothers and Barnum & Bailey Circus had more rigor, with genuine training, but the principle was the same: Easy access to being a clown. Meanwhile Shrine clowns, originally amateurs with a minor role next to the professionals at circuses sponsored by local Shrine organizations, sometimes became a show’s only clowns. While the craft of circus clowning remained as difficult to master as it ever had been, and “clown” remained a symbol of the outsider, the working clown no longer stood outside society. Unusual, yes; outsider, no. This major change in clowning corresponded to major changes in the Sixties. The free-spirit hippie, with long hair, outlandish clothes and rainbow suspenders, looked a lot like the clown. But it wasn’t simply the counter-culture: Many forces were breaking down old notions of settling down in one job in one place for a lifetime. While joining the circus could be depicted as a bold rejection of “The Establishment,” millions of other Americans could depict themselves as similarly bold, setting off on their own adventures, paths, and changes. That included changes in women’s roles. Historically women clowns were rare, for a vast range of reasons beyond the scope of this survey. Commedia dell’arte did use women performers, including Isabella Adreini, also a writer and an intellectual. But commedia was an exception. Because of expectations about the woman’s role in the world, few women became clowns for the first two centuries of circus. Even as late as the 1970s, when women were moving into traditional male fields generally, some questioned whether a woman could really be a clown. The benign interpretation is that a clown’s loss of dignity is beneath women; the more restrictive view insisted that, despite sterling examples such as Lucille Ball, women didn’t have what it takes to do boisterous comedy. Many women clowns have since made such questioners look silly. Clown College helped propel these changes. Started in 1968 by Ringling Brothers and Barnum & Bailey Circus, it was held annually in the fall, originally at Ringling’s Winter Quarters in Venice, Florida. The wide array of courses ranged from performance-oriented classes like gags, mime, dancing, juggling, gymnastics, and stilt-walking, to clown-helpful crafts such as sewing, wig-making, and nose-making. Clown history class and sessions on Ringling broadened the perspective. The staff combined specialists in particular fields and Ringling clowns who came off the road to teach. While few students became expert at anything, the schedule introduced whatever might be of use to a clown, with individual improvement depending on aptitude and practice. It all lead to a graduation performance that was also an audition for a job with Ringling. After moving to Baraboo, Wisconsin, and then Sarasota, Florida, the school closed following the 1997 session. Critics have said that Clown College didn’t teach clowning but only created those who had clean makeups and costumes, to fit into the giant Ringling spectacles. And it was certainly true that not every graduate became a good clown. That reaches a larger question, whether any school can teach clowning. Of course this one produced many clowns for Ringling and other circuses, some of whom are still clowning and teaching lessons they learned. But the evidence of four decades suggests that the lessons of clowning are still learned best as they have been historically, from mentors, from audiences, and from mistakes. George Burns said “The circus is the only place left to fail.” While every new clown seems determined to prove him right, a few through the years got better by tapping into his implied message, that a clown learns through mistakes. The free-spirit impulse that created hippies and propelled Clown College combined in the counter-culture clown. It is no accident that new approaches to clowning emerged significantly in New York City and the San Francisco area, strongly identified with the counter-culture movement. Just as hippies scorned “The Establishment,” so did these new clowns scorn established circuses and their clowns. Closer to the talking clowns of the mid-1800s, these new clowns made words an important part of their comedy. A key element of that talk was irony, poking fun at traditional notions and calling attention to their own performance. (Irony and self-reference were standard comedy techniques out of the 60s, employed by stand-up comedians, late-night comics, sit-coms, and — irony layered on irony — by many “traditional” 3-ring clowns as well.) The talking also led to a renewed partnership with the audience. The late nineteenth century had decided that “art” should ignore audiences, and “entertainment” should amuse an essentially passive and monolithic body, but Sixties clowns revived the close performer-audience connection that had been fundamental through centuries of performance history. Perhaps the most significant development was a Canadian group that grew to a troupe, and then a circus, Cirque du Soleil. With touring shows and other shows in theaters in Las Vegas, it’s the largest circus organization in the world, and apparently still growing. Their shows have comedy, and clown-like figures, usually a shabby Everyman, vaguely like a tramp clown. Even as Cirque du Soleil seems determined to single-handedly revive circus as a popular, talked-about amusement, its comic figure remain more like characters in a play than traditional circus figures offering stand-alone gags and comic routines. This hippie influence generated new clown symbols; like the older ones, they immediately seemed ancient and revered. The most obvious symbol claimed the clown as the ultimate free-spirit. As this new age celebrated being weird or having a childlike innocence, so did the clown become a hippie dream in baggy clothes and wild hair, a symbolic improvement on now-scorned normality. The other new clown symbol was the truth-telling trickster. That appealed to the political activism of the new age, framing any potentially contrary pose or statement as a challenge to powers-that-be. At the same time the academic world was digging up possible historical examples, in Native American “contraries” and court jesters, all increasingly seen as daring political figures. As discussed above, actual instances of trickster challenge are rare but, as with other clown symbols, the cultural urge to celebrate the symbol trumps mere facts. This participatory urge had another huge effect, in the explosion of clowning outside the traditional venues and beyond wider public notice. It might be called amateur clowning, and the majority probably are amateurs in the traditional sense, seeking to make no money but doing it only because they enjoy it. That includes a new category, hospital clowns who visit sick children, which combines the human urge to comfort, the century-old sentimentality of clown-with-sick-child, and good publicity. Meanwhile, many of these clowns make money performing at birthday parties or other events, and a few even support themselves that way. These and other clowns outside the circus find comradeship and support in amateur clown organizations, such as the Clowns of America International and the World Clown Association. “Three Types of Clowns” ? Because Clown College strongly influenced — and may have started — the current idea that there are three types of clowns, it might be helpful to address this topic here. This division splits clowns into whiteface, auguste, and character clown. The dominance of this three-part division after the 1960s suggests the influence of a pamphlet created and illustrated by the school’s second dean, Bill Ballantine. This three-part split does make teaching easier, helping would-be clowns sort through comic impulses. That split also reflects comic traits. The whiteface and auguste fit the straight man/stooge comedy pair, while the character clown, especially the currently popular tramp clown, represents the solo comic figure. However, any clown “type” is inherently vague, as traits inevitably overlap. For instance, the blackface circus clown before the Civil War talked but was not considered a “talking clown.” Similarly whiteface clowns were originally knockabout comedians, while today they’re often considered too refined for broad physical comedy. This division of convenience has evolved into what many consider requirements. That urge for certainty may reflect growing uncertainty about what a clown is. Before Clown College, a circus clown was simply and clearly the costumed comic figure in a circus. But after the Sixties, a “clown” could be someone who had just graduated from Clown College, with no experience, or anyone who simply decided to apply makeup and throw on mismatched clothes. In such a fluid situation, it could be reassuring to have rules to follow, an attempt to prove that one was “officially” a clown. That urge to claim the role would explain the rise in common use of clown slang, such as “Joey,” “Clown Alley,” and “First-of-May” (rookie). The auguste (pronounced aw-GOOST) typically has skin-tone makeup, with a red nose and white around the mouth and eyes, and wears baggy pants. This is what most people consider a generic “circus clown.” Some wear more elegant costumes, and can be called “neat” augustes. The auguste is usually the stooge or second-banana in a comedy pair, though it can also function like a whiteface. 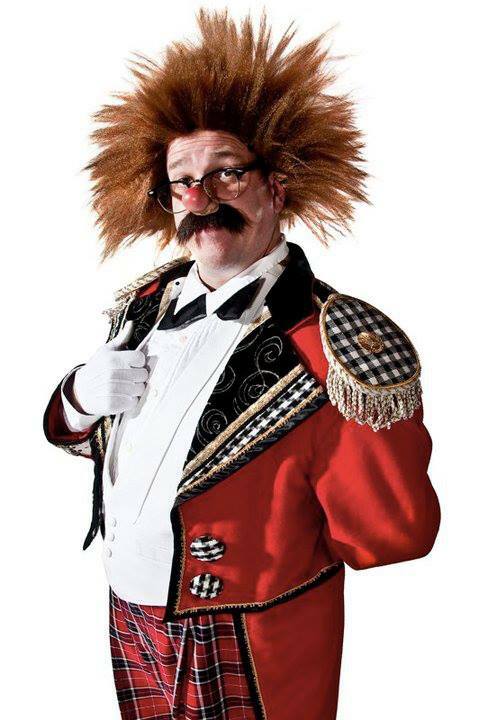 The most common origin story says that an American performer (variously a clown, rider, or acrobat) named Tom Belling was kicked out of his circus in Germany in the 1860s and got laughs when he snuck back in dressed in oversized clothes, fell, and bloodied his nose, with the baggy pants, red nose and blundering establishing the “type.” The label “auguste” has various origin stories itself; a likely one says it began as an ironic flip of “august” (aw-GUST), the word for dignified. Some see a class division, with the whiteface representing the elite, the auguste as exemplar of the rising / struggling middle class, and the tramp clown standing for the lower class. The character clown is not really a type, even in this three-part division, but a category encompassing many types of clowns. Anything that can be identified as a character, such as a policeman or a professor, can be turned into a character clown. Perhaps the first character clown was one of the most popular ever, the rube clown. Nineteenth-century stages and circuses were full of this unsophisticated hick from the sticks, and some still play it. 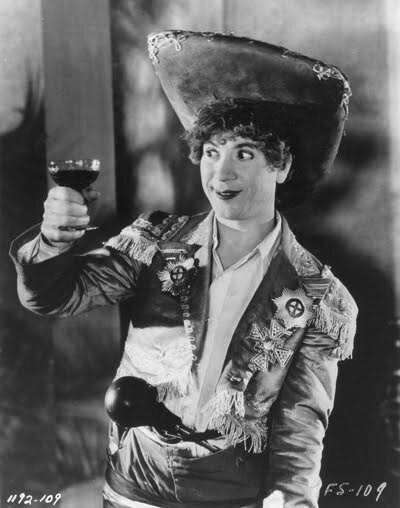 The non-circus rodeo clown, for instance, is costumed like the rube clown. Other character clowns in the 1800s were “ethnic” clowns, based on major immigrant groups, the “Dutch” (German), Irish, Italian, and “Hebrew” (Jews). (The Jewish comedian Chico Marx played an Italian character.) With the increase in woman clowns, the “cute little girl” emerged as a type. Currently, the most common character clown is the tramp clown, evolved in the late 1800s from unemployed tramps caused by the Industrial Revolution. (Some writers, on no apparent evidence, distinguish between tramp and hobo.) The tramp clown has become a symbol of the sad, lovable clown; ironically as the tramp clown became more lovable, the original tramp, the homeless person, became more scorned. The character clown demonstrates the imprecise nature of clown categories: With males clowns often playing exaggerated females, are they “women" characters,” whitefaces dressed in drag, or augustes simply goofing around? In the late 1800s, clowns often entered the ring with the then-celebrated cry, “Here we are again!” As the late 1900s turned to the twenty-first century, that cry applied across the clowning world, with the multiplication of types, venues, and comic impulses. This multiplication can’t hide the fade of 3-ring clowning. Ringling, still the major traditional circus, shut down its Clown College, reduced the size of its Clown Alley, and turned to headliner clowns, the sweet David Larible and the acrobatic Bello Nock. Other traditional circuses often now have only a clown or two; some present shows with no clowns. While clowns who remained continue to present gags, they increasingly transform traditional improvisation with the audience into audience interaction as a semi-scripted part of their work. This seeming spontaneity often includes planted props and whispered instructions. As actual 3-ring clowning decreases, the clown-as-symbol increases. Television, movies, and advertisements repeatedly employ the clown to represent hilarity or an ultimate children’s pleasure. Because the link to genuine clowning weakens year by year, those examples increasingly repeat each other’s clichés, and the symbols become less and less reflective of what a real clown would do. Though Cirque du Soleil shows seem too dark and hard-edged to be sentimental, they contribute to the sentimentalization of the clown, with their recurring outsider figure, a stranger-in-a-strange-land as lovable as the tramp clown. As clown symbolism expanded, it took a sharp turn into the 21st-century, into the Scary Clown. Children have periodically been afraid of clowns, just as children are afraid of thunder or cops or their teacher on the first day of kindergarten; it was a part of the circus landscape, easily managed by an experienced clown. However conventional wisdom began to accept it as a legitimate phobia. Reasons for that change are murky but four elements suggest themselves. First, the huge increase in amateur clowns and young clowns out of Clown College meant a growing number of clowns without the experience to deal with occasional flights of children’s fright. Second, the rise of the Internet meant that the scary-clown symbol could be easily repeated, with repetition making it seem legitimate. Third, just as the sad-clown cliché relied on a contrast from the assumption of unalloyed happiness, movies relied on the same contrast as they featured deliberately scary clowns. Fourth, similarly, the rarely achieved assumption of perfect hilarity and happiness, and the correspondingly vapid clowns symbols, generated a reaction. Though clowns are no more or less likable than any other performer, to proclaim a dislike of clowns became the newest clown symbol, an inherent boast of being independent. Because talking clowns faded from the circus, those like Dan Rice seemed a dead end. However, his brand of clowning / comedy continued onto the vaudeville stage, next into movies, and then into television. The Marx Brothers, Danny Kaye, Red Skelton, Bob Hope and many other comedians carried the DNA of Dan Rice’s comedy. It would take over a century though before cable television and the Internet created the true successors of political clowns like Rice, in entertainer / political commentators like Jon Stewart on the left and Glenn Beck on the right. - Remy, Tristan. Clown Scenes. A look at classic clown routines by a leading French circus historian. - Speaight, George. Clown. A noted circus historian looks at clown history from a British and European perspective, with many color pictures. - Towsen, John. Clowns. Remarkably, though written thirty years ago, this probably is still the best single volume on the history of clowns. - Late 1700s-early 1800s: Dickens, Charles. The Memoirs of Joseph Grimaldi. More Dickens’ version than a memoir, it strongly influenced what people think of clowns. - 1800s: Bratton, Jacky and Ann Featherstone. The Victorian Clown. This is a three-part look at early clowning in England (overlapping issues of American clowning): An 1840s overview; a memoir from the 1850s; and a collection of clown sketches from the 1870s. - 1800s: Carlyon, David. Dan Rice: The Most Famous Man You’ve Never Heard Of. Though some of its details of American culture will not interest all, this book focuses on what 19th-century clowns actually did in the circus ring, and how Rice fit a changing American culture. - Mid-1900s: Ballantine, Bill. Clown Alley. The second dean of Ringling’s Clown College gives an insider’s perspective on clowning with the circus. - Late 1900s: Jenkins, Ron. Acrobats of the Soul: Comedy & Virtuosity in Contemporary American Theatre. While offering a steady stream of truth-tellers defying conformity, it does give a helpful overview of the new clowns that would have a strong influence into the 21st century. - Boll, Heinrich. The Clown. A Nobel-Prize winner used the character of a clown to examine German national, political and religious soul-searching after World War II. - Miller, Henry. Smile at the Foot of the Ladder. This slim book romantically depicts its hero-clown seeking not fame or huge laughs, but the humble, human connection of smiles. Frederic Denver Pfening, Jr. passed away on September 6, 2010, at the age of 85. He is survived by his loving wife of 63 years, Lelia B. Pfening; two sons, Frederic III (Janet), and Timothy (Suzi); three grandchildren, Victoria Pfening Smith, Lesley Pfening, and Frederic Pfening IV; and one great-grandchild, Madeline Smith. He will be missed by all. A life-long resident of Columbus, he attended Upper Arlington High School where he was on the swimming team and had a column in the school newspaper. His summer job in 1941 was with the Barr Bros. Circus and in 1942 with Ringling Bros. After graduating in 1943, he served in the United States Army. He attended The Ohio State University from 1944 to 1948. While a student, he was a cheerleader, a member of Bucket and Dipper; and editor of the Sundial, the college humor magazine. In his spare time he paid his way through school as a photographer at various campus social events. In 1948 he joined the Fred D. Pfening Company, a manufacturer of equipment for the wholesale baking industry, founded by his father in 1919. He was President of the company from 1954 until 1989, after which he became Board Chairman. He was also President of four other companies, the most interesting of which was the Fred J. Mack Circus which he operated in 1955. He served on many non-profit boards including, COSI, the Columbus Museum of Art, the Friends of The Ohio State University Libraries, the Riverside Hospital Foundation, the Circus World Museum, the Crippled Childrens’ Society, and the Upper Arlington Arts Council. He was a lifetime member of First Community Church. He was the recipient of many honors. The two that meant the most to him were election to the Columbus Business Hall of Fame, and a Lifetime Achievement award from the Bakery Equipment Manufacturers’ Association. He was a member of the Young Presidents Organization (YPO), Chief Executives Forum, the Columbus Rotary Club, the Columbus Club, Scioto Country Club, The Ohio State President’s Club, the American Society of Baking, the Columbus Food and Wine Society, and Chaine des Rotisseurs, among others. He was able to drive until 2 months before he passed. The circus was his passion. He was a member of the Circus Historical Society for close to 70 years, he was President of the organization from 1958 to 1963, and later served on its Board of Trustees. He was editor of Bandwagon, the journal of the Circus Historical Society, from 1961 until his death, and was internationally recognized as an expert on the circus. He counted many circus professionals among his friends. Visitation will be at the Schoedinger Northwest Chapel, 1740 Zollinger Road, Columbus, Ohio 43221 on Wednesday, September 15, from 4:00 to 8:00 p. m. A memorial service will be held at First Community Church, 1320 Cambridge Boulevard, Columbus, Ohio 43212 on Thursday, September 16 at 11:00 a. m. Dr. Richard Wing officiating. Flowers may be ordered through Evans Floral, 1-800-607-8575. Contributions may be made to the Circus World Museum, 550 Water Street, Baraboo, Wisconsin 53913, and to COSI Columbus attn: Development Department 333 West Broad Street Columbus, OH 43215. Please visit www.schoedinger.com to extend condolences and share memories. NOUVEAU CLOWN INSTITUTE: A Few Spaces Still Available for October 2010! Some places still remain for the Nouveau Clown Institute course in Barcelona, Spain this October but time is slipping by and you better take the leap now and register before you lose the opportunity. Click the title of this post to be taken to the N.C.I. website. In my life, there are few greater pleasures than finding a photo of Harry Dann that I haven't seen before. ZIRK DER RUHE: Tickets Now on Sale for Annapolis, MD Oct. 3rd, 2010! Tickets are on sale now for Zirk der Ruhe's show at Annapolis, MD's Maryland Hall for the Creative Arts. Appearing will be Michael Rosman, Mark Lohr, Matthew Pauli, Shelly Guy and myself. for the "Greatest Thing Since the Invention of Hyperbole"!!! Thanks to Vince Pagliano's Funny Factory Productions Jerry Hunsberger and I returned for our third consecutive appearance at the South Plainfield, NJ Labor Day Parade, the largest Labor Day Parade in the state and one of the largest in the nation. I found this photo of me, but not the car that I was arguing with, on South Painfield's website. You could not have asked for a more perfect day for a parade and a more receptive audience to perform for.